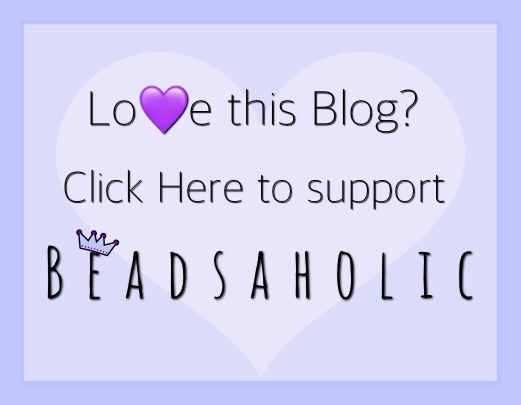 Today Beadsaholic brings a review of Trollbeads Love Birds. This year Trollbeads is introducing Love Birds as their Valentine’s 2019 bead and it is one cute bead! I raised lovebirds for about fifteen years, and they are among my favorite parrots! They may not talk, but they have comical and lovely personalities and there is nothing cuter than watching them snuggle up together. Trollbeads Love Birds is one of the prettiest bird beads I’ve seen. I like the style and the way it sits between beads. There are two lovebirds one on each side of the bead; however, when wearing, you only see one bird. This is not a huge bead but as you can see in the compositions I’ve shared here it shows up well. The batteries in my calipers are dead so, right now I can’t get measurements, but you should be able to judge the size next to standard 14 mm glass. Love Birds retails for $45 / €45, price in euros includes vat. I really love the look of the Love Birds with Pearls and the new Lush Meadow bead. The Love Birds looks fantastic with the 2018 Mother’s Day Bead Mama Mia and pearls. For the perfect Valentine’s Bracelet, I’ve added some pink and red heart uniques. Here you can see the size next to these 13-14 mm beads from the Spring collection. Over all, this is a must have for any Trollbeads collector, it’s a nice design that is versatile throughout the year. Trollbeads Love Birds will be available in store and online on February 1, 2019 and will be available at the following links. 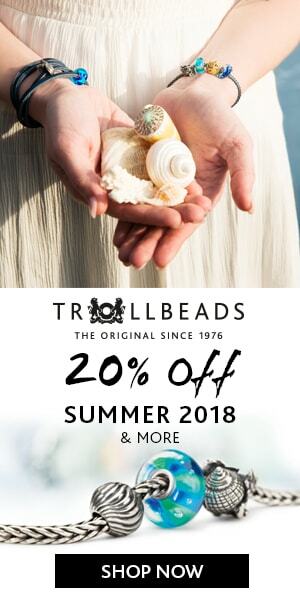 Please note, that the Trollbeads USA banner is an affiliate link and only ships in the USA, all retailers below banner ship world-wide. ← Celtic Creations Spring Sneak Peek!